Manager Rafael Benitez says Newcastle will struggle to “have a go” in this season’s FA Cup because of their position in the Premier League. The Magpies fell to 18th in the league on Saturday after defeat to Chelsea. 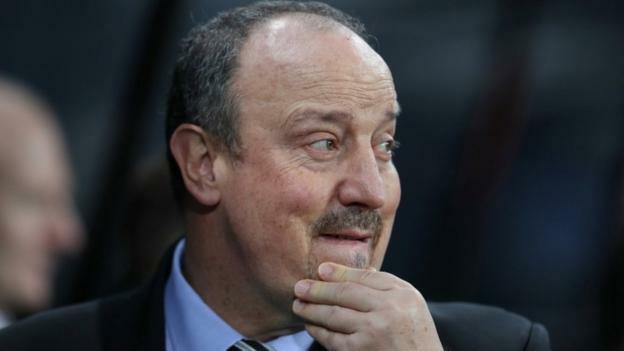 Benitez said he will rotate his squad for the third-round replay against Blackburn on Tuesday, as he did when the teams drew 1-1 at St James’ Park. He said clubs have to be “realistic” about their FA Cup chances when deciding to prioritise the competition. Mohamed Diame, Paul Dummett and Jonjo Shelvey remain out for Newcastle for the trip to Ewood Park. Freddie Woodman, Javier Manquillo, Jamie Sterry and Jacob Murphy are among those likely to come in. Charlie Mulgrew and Derrick Williams could feature for Blackburn. The pair trained before the game having missed the weekend win against Millwall in the Championship. However, midfielder Corry Evans is unlikely to play due to injury. “We’re playing a Premier League side,” Blackburn manager Tony Mowbray said. “The team know how tough the game is going to be but we always believe we can win, particularly at home. Blackburn have won just two of their 12 FA Cup matches against Newcastle United (D4 L6). However, both of those victories have come at home, winning 4-1 in the third round in 1927-28 and 1-0 in the fifth round in 1992-93. Blackburn are unbeaten in their last three games against Newcastle United in all competitions (W2 D1) – the Magpies last went longer without a victory against Blackburn in all competitions between May 2007 and February 2011 (P7 W0 D1 L6). Newcastle United have been taken to a replay in the third round of the FA Cup for the second time in the last three seasons, progressing past Birmingham in 2016-17. Blackburn have lost their last three FA Cup ties against Premier League opponents, since beating Stoke 4-1 in the fifth round in 2014-15.